Note: The Canon EF 35mm f/1.4L USM Lens has been replaced by the Canon EF 35mm f/1.4L II USM Lens. 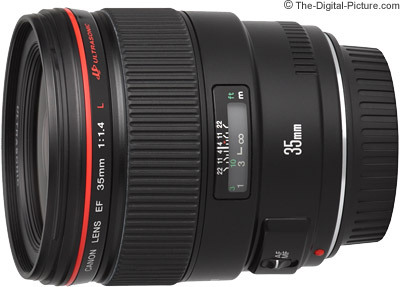 The EF 35mm f/1.4L USM Lens is a really nice and very well regarded Canon prime lens. The 35 L has membership in the Canon L Lens club - and it shows. Build quality is addictingly excellent - professional grade. For an L lens, this lens is relatively small - 3.1" x 3.4" (79.0mm x 86.0mm)(DxL) - and light - 20.5 oz (580g). 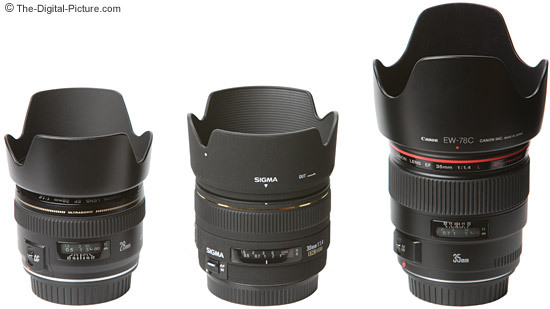 Even smaller than the Canon 16-35mm f/2.8L USM Lens. You know there is something in your hand, but the weight is not bothersome. The lens handles very well on the camera. The 35 f/1.4L focuses fast and silently thanks to the Ring USM (Ultrasonic Motor). FTM (Full Time Manual focus) is supported as well. The Canon EF 35mm f/1.4L USM Lens is slightly soft at f/1.4, but useable in my opinion. There is a noticeable improvement by f/2.0 (quite sharp). Some vignetting will be apparent to Full Frame and 1.3x FOVCF DSLR users until stopped down f/2 or so. Any distortion present is very minimal - FOVCF body users should notice none. The Canon EF 35mm f/1.4L USM Lens trails the far less expensive Canon EF 35mm f/2.0 Lens in center sharpness by a very slight amount at f/2. However, the 35 L is far sharper in the corners even on a 1.6x FOVCF body. The 35 L has better contrast and saturation than the f/2 version. At similar apertures narrower than f/2.8, the 35 L was similarly sharp or less sharp than my Canon 24-70mm f/2.8L USM Lens at 35mm. Although the 35mm L has a different focal length than the Canon 24mm f/1.4L USM Lens, The two are very similar in build, image quality and price - and may both suit some of the same applications. The 35 L proved similar to my 24 L in most comparison tests. Both exhibited some light fall-off wide open even on a 1.3x FOVCF body. At similar apertures, the 35 f/1.4L was clearly sharper than my Canon 16-35mm f/2.8L USM Lens at 35mm. The difference narrowed to very little by f/4 and was nearly gone at f/8. The minimum focus distance of the 35 L is .98' (.3m). While not stellar in the native maximum magnification department (.18x), extension tubes make a huge difference - .54x and .97x for the 12mm and 25mm tubes respectively. Keep in mind that you need a pleasing wide background as 35mm will include a lot of it in your shot. If you prefer a wider focal length lens for landscape photography, the 35 L can fit the purpose if 35mm is right for you. Full body portrait photography is another good use for this lens. I don't recommend using a 35mm focal length lens for closer portrait work (such as head shots) because body features (such as noses) tend to get exaggerated. That said, this lens can be ideal for loosely cropped full body portraits - especially in limited space situations. Low available light portraits and other similar casual and formal shots are probably the use for which the Canon EF 35mm f/1.4L USM Lens' shines brightest. Shooting under available light indoors after dark with the camera handheld is usually possible with this lens. The relatively wide focal length paired with a very fast f/1.4 aperture makes the 35 L a very good handheld indoor (without flash) lens. Here are two things to keep in mind when shooting with this lens: At f/1.4, DOF (Depth of Field) is very short with close subjects. It is unlikely that an entire family will be in focus if you are shooting a tight-framed picture at f/1.4. And just because you can handhold this lens at lower shutter speeds (because of the slightly-wide focal length), doesn't mean you should - Subject motion becomes an issue at these shutter speeds. Low light handholdability makes the Canon EF 35mm f/1.4L USM Lens a favorite for wedding photography. This lens paired with the Canon EF 85mm f/1.2L II USM Lens makes up many wedding photographer's non-flash/available light lens selection. Pull the 35 L out to capture the family gathering or your child's birthday party. Many uses can be found at church or school. For me, the real advantage of this lens is for low light work. But, the 35 L could be a nice general-purpose lens. When mounted on a Canon camera with a 1.3x or 1.6x FOVCF, the result is near to the classic normal 50mm lens. Many people have used a 50mm lens exclusively for many years on their film SLR bodies as many film SLRs were sold as a kit with a 50mm lens. I highly prefer the Canon EF 35mm f/1.4L USM Lens over the Canon EF 35mm f/2.0 Lens. For its better image quality, for its better wide-open image quality and for its wider aperture. I far more frequently pick up the Canon 24-70mm f/2.8L USM Lens or the Canon EF 24-105mm f/4L IS USM Lens for general purpose use. The niche I fill with the Canon EF 35mm f/1.4L USM Lens is primarily low available light situation photography. The 35 f/1.4 box includes an EW-78C lens hood and an LP1214 lens pouch.